At Sea - Our Port Was Closed! Well, we had a great time. Four days in Spain, 12 days on the Royal Clipper and four days in Rome - what's not to like? We expected great service and great food on the Clipper and we got it. But, we also expected more sailing but we were more like a motorboat than a sailing vessel. Also unexpected was the 70 mph winds with 25 foot waves for a full day but the ship handled the weather safely although with a lot of rolling. Being driven through Rome to the airport at over 100 mph was something I would not want to repeat! Still, it all was a grand adventure and lots of fun. As for the future, we plan on a cruise to Long Island Sound starting the end of June for six weeks, returning by August 15 to get ready for our grand cruise down the Intercoastal Waterway (ICW) on Fleetwing to Florida for the winter. We have a dock reserved in Key West for the month of February. I will be writing blogs for both cruises so you'll be able to follow them right here. I have to work on Fleetwing, our 42 foot Beneteau 423, to get it ready for launch later this month. I'm adding a Class B AIS transponder so I'll be visible on other ships' AIS detectors and an isolation transformer to save my zincs when in a marina, lots to do! So long until the end of June. The day started at 5:00 am. Our plane wasn't scheduled to leave until 9:50 but we were unsure of the traffic and the last thing we wanted to be was late. The news in the morning about the volcano was not good. It seems there was a cloud of ash over Spain that was drifting right for Rome. The ash is spread by however the winds happen to blow and now the winds were directing the ash in our direction! A previous day's flight had taken off but some of the passengers had been bumped due to the additional fuel required. With all the uncertainty, we figured better early than late! The cab was on time at 6:00 am, great! We all jumped in and headed out. There are cab rides and then there are cab rides. I've ridden in NYC, in Paris and several other cities but we were in for a real "treat". It started out innocently enough with a romp through downtown Rome city streets at 60 mph. True enough it was early and there wasn't much traffic but there were plenty of side streets for cars to appear from. Gradually, the speeds between stop lights gradually grew, 65 then 70. Hummm, kinda of fast for the route I thought - but that was only the beginning. 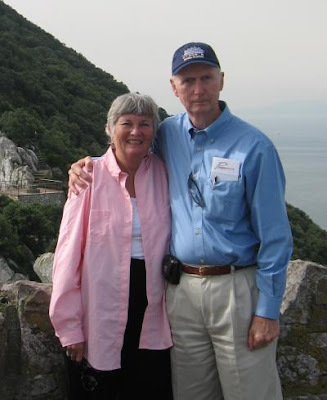 When we had first arrived, we took the high speed train to Rome from the boat terminal and were amazed when it reached 98 mph. I was in the back seat and watched the speedometer climb as we reached the arterial to the airport, sort of like our route 9 but four lanes mostly. We peaked out at 102 mph (the readout was in km/hr but I was doing the math as we sped along)! Going around corners, I held the strap above the door and Ann held on to the edge of the front seat. The G-forces required attention. So on the way to the airport, we were faster than the high speed train! In case you're wondering, we made it okay. At the airport we were deposited at Terminal 5 and waited for it to open, we were real early - but not the first ones there! We later found out that the ones there even before us had been bumped yesterday from their flight. They were even more nervous about getting out. After passing through three security screens, we finally reached the main terminal with food and had breakfast. Then the long wait came and the interminable wait as wait listed names were called, every seat was to be filled! Our plane was late in loading and we later found out that the airport was almost closed due to the ash cloud headed in our direction. It apparently was a close thing and we were lucky to take off at all. 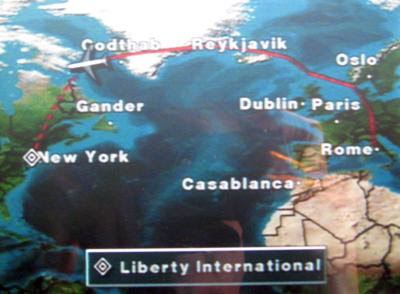 In fact, the plane did not follow the usual path to NYC. 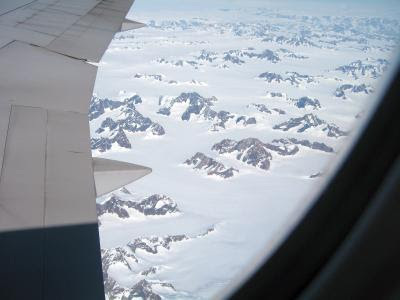 Instead, the pilot took us due north over Europe and took a turn west and then north of Iceland, over Greenland (pictured at left) and then down over Quebec and into NY. The northern route added 1.5 hours to our flight time. Finally we landed and it's great to be home, how sweet is the USA! We had reserved Tuesday morning for the Vatican on the premise that it would be an off day for visitors, at least compared to Sunday or any other day of the week. We had finally figured out the maze of bus routes, mostly that is, and actually got within walking distance of the city. We were dismayed at the ticket line snaking around the corner, out of sight. We had tickets already but that meant there was to be a crowd. The Vatican was jammed packed with people, just a dense flow of humanity in a tide along the viewing corridors. Regardless, we found the Vatican just overwhelming in size and in the extent and impressiveness of the art. There are no words to do justice to our experience, just staggering. I've included a few small photos but they do not approach the physical experience of walking through the enormous halls with paintings and sculptures beyond number on display (such as the room on the right). 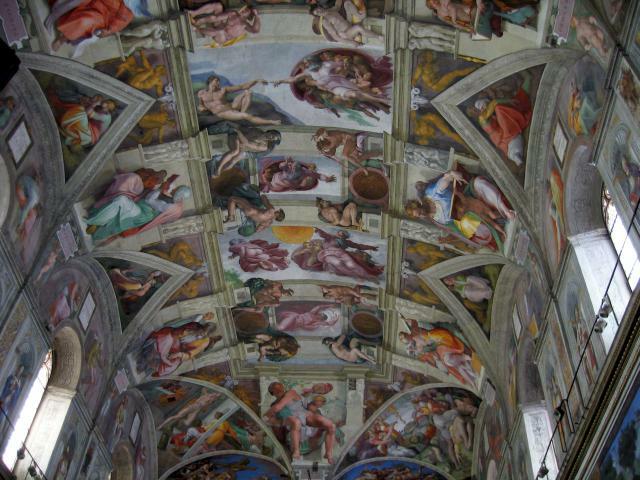 The peak of the visit was the Sistine Chapel. Calling it a Chapel is an understatement, it's huge and the paintings by Michelangelo are stunning in person, beyond words. They've been restored and the colors are bright and true but as in all cases of art, it's the composition that counts and Michelangelo has all the talents. We sat down on a side bench and just stared up at Michelangelo's masterpiece on the ceiling. The painting at the right shows the skill of the time period. The awning and people in the painting are all just on canvas even through the awning looks very 3D, you'd swear it's standing out from the wall - something added to the wall to enhance the painting. The illusion doesn't fade away until you're almost directly under it and can see that it's just a painting. 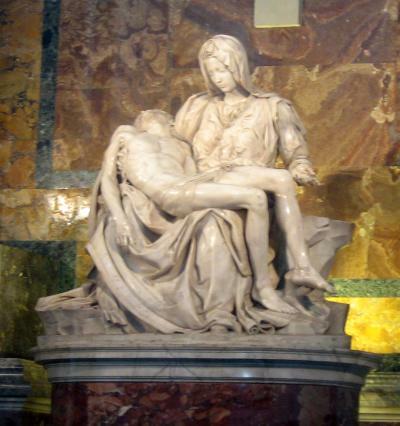 No visit to the Vatican would be complete without seeing Michelangelo's Pieta. I saw the sculpture once at the World's Fair in NYC long ago and was eager to see it again. We wandered around the St. Peter's until we found it by the front doors. It was as beautiful as I remembered. I took a photo but it was not the same. 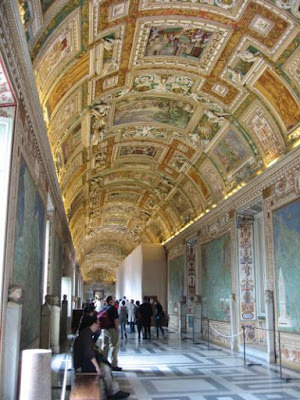 We continued on to explore the rest of St. Peter's, it was like a small city with halls and corridors branching off at every junction, just awesome. We found our way back to our hotel by taking the right bus for a change (bus 40). Most of the museums are closed on Mondays in Rome so we decided to spend the day exploring the Colosseum, the place in Rome where the Gladiators fought. As we walked along the street approaching it, the size slowly became apparent, it’s huge. This time we opted for a tour guide. He reminded us that during the summer the temperature could reach 105F in the full sun while today it was in the 70s, nice weather. The Colosseum was built for the entertainment of Roman citizens and the seating arrangement was by how important you were in Rome. The tickets were hard to come by and were marked as to the seat number you had. However, the form of the entertainment was something else. There were professional gladiators and then there were the slaves. The professionals made up roughly 5% of the combatants and you can guess who didn’t make it. The unfortunates who made up the 95% part were mostly criminals and conquered armies. 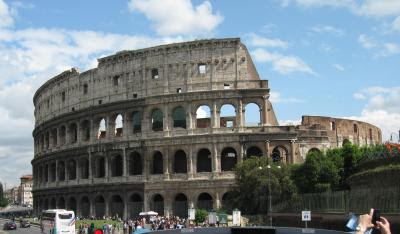 In one notable time period, there were 10,000 gladiators slain over the course of two days! 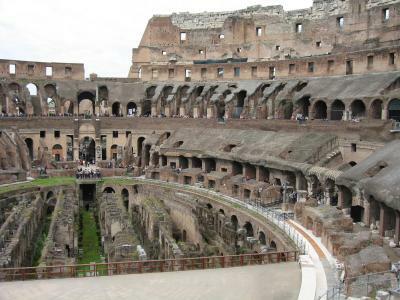 There were an estimated 500,000 slain over the lifetime of the Colosseum before the gladiator fights were stopped. Human life was cheap back then. Also added to the mix was wild animals brought back from countries conquered by Rome which were set upon the slaves for the entertainment of the spectators. It is hard to imagine such things today. Some of the Olympic games were imported from Greece but they didn’t catch on, it seemed the Romans liked their blood. It still felt strange to be walking in the exact paths taken by all those spectators so many years ago, walking on the same stones, sitting on the same stone benches, wow. The floor was covered with wood planks where now the underlying chambers are visible. 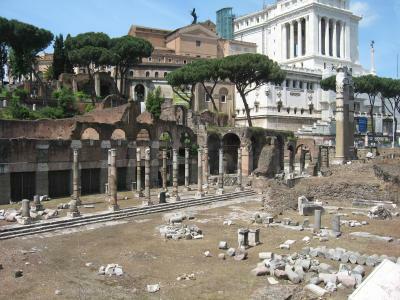 Other parts have been damaged and some of the facing stone removed for other buildings in Rome. Now there is a great restoration underway as there is with all the antiquities. 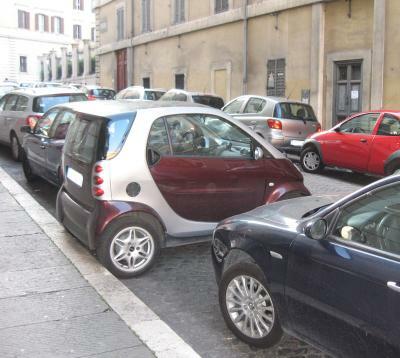 In Spain and France, most of the cars were just as big as in the states but not so in Rome. There were many cars that were just one passenger big. They were so short that they could be parked directly into the curb instead of parallel parked. It looked funny but it was certainly efficient. Even more numerous were the many scooters, all over the place and dipping in and out of traffic, always going in front of everyone. 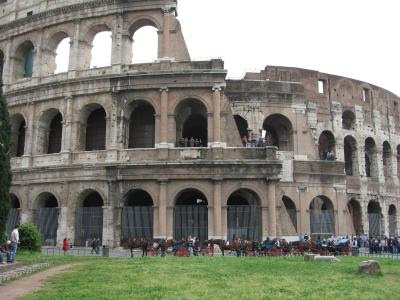 Our hotel is close to the center of Rome with the antiquities in easy walking distance. We had breakfast out on our balcony served by the staff, very nice. So today we walked over to the see what they call the antiquities, the places where the Caesars and the Roman Senate conducted their business. It is hard to convey the sense of wonder when walking on the same stones paths that Julius Caesar walked, to be in the Forum where Caesar was assassinated. You are right there - where it happened! We are so used to recreations on TV or Disneyland type reproductions of the events - but to really be there makes all the difference. The photos are rather ordinary but the "being there" is not, that's the part about being in Rome that's hard to convey. The antiquities area requires an entry fee that's good for 24 hours and you can also get a headset for audio information. There's a massive amount of information available but for the most part we just wandered around which we found interesting enough. We sure made up for all the rest we got on our cruise, lots of walking for exercise. We found a typical street side restaurant for lunch and we had, surprise, a pizza! Then it was on to see the place where Three Coins in the Fountain was filmed, The Trevi Fountain. It's not far from our hotel. When we arrived that place was mobbed! We had expected a round fountain that you could walk around and see from all angles. However, it's situated against the side of a building and has several rows of seating in front of the fountain for people to sit and admire the waters. Even with the mob on a Sunday afternoon, the visit was memorable, the fountain is more beautiful than in the photos. 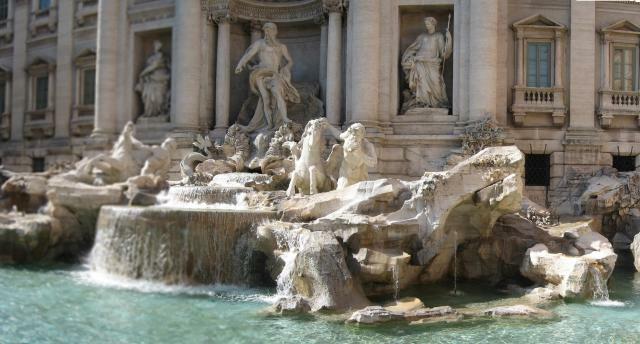 To see a video of a couple tossing the traditional two coins in the fountain, click here. 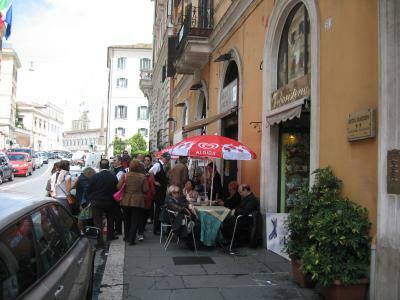 A few notes on getting around in Rome. The most frequent sight in Rome are tourists standing on street corners with a map (or maps) open, trying to figure out where they are at. The street signs are mostly a mystery and sparsely distributed at random around buildings. Add into the mix that the streets go in every direction and are rarely straight and with many streets intersecting at all angles at plazas. It takes awhile to even have any idea of how to proceed. When all else fails, we get out the iQue and plot a route. We had to put our luggage out in front of our cabin door by 4:00 am so we put ours out the night before. We were up at 6:00 am to get ready for departure. All during our stay on the ship, whatever we needed was charged to our room card which we received when we boarded. It was like plastic money but now the day of reckoning arrived. In exchange for paying our bill, we received our passports back. All throughout the cruise, whenever we went ashore, we just showed our cabin card to pass through customs which only consisted of one person - we were always just waved through as long as we had that card. As far as I can tell, we never actually exited Spain formally and coming into Italy we were just waved through (no baggage check either). We chose to brave the trains to reach Rome instead of taking a shuttle bus, much cheaper using the trains. However, we had to roll our luggage to the train station about 0.3 miles and up and down several ramps. Leathem had some knowledge of Italian which helped greatly. He finally sorted through the confusion and got our tickets for a train to Rome. On the way there, I clocked the speed at 100 mph using my iQue with its embedded GPS. We made it off the train at the right stop (no mean feat) and was then faced with figuring out the Italian subway system to reach a point near our hotel in Rome. After several more ups and downs stairs with all our luggage (ugh!) we boarded the subway. The subway car was covered inside and out with graffiti! How disappointing. As a matter of fact, we saw graffiti everywhere on our way to Rome. The inside of the subway terminal was also covered with graffiti and it's all over Rome too with the exception of the monuments, which at least are kept clean of it. The hotel did not have an elevator but it did have a very helpful clerk who hauled our bags up the two flights of stairs. 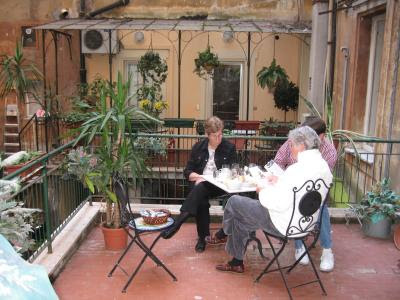 Our rooms are very nice and I would recommend the hotel to others, it's Hotel Giardino and it's centrally located, close to the antiquities of Rome. It also has free WiFi! 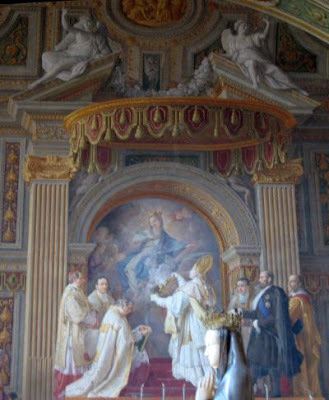 It's pictured in the photo above, the door is at the far right in the photo. 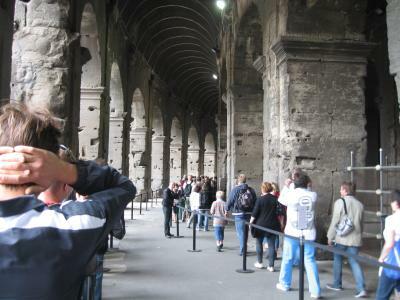 The first order of business was a ride on a two story bus around Rome just to get a quick overview of the sights. 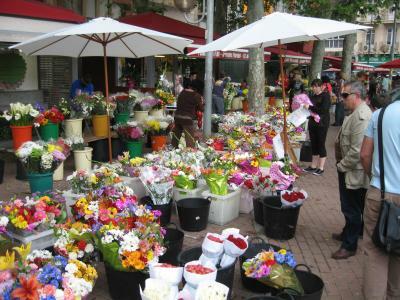 Tomorrow we'll do a walking tour and take lots of pictures. We had a nice meal at a very small restaurant recommended by our helpful clerk and collapsed in bed. What a tiring day. I wish you guys in the states would take care of the stock market while we're gone!! We leave and everything falls apart! 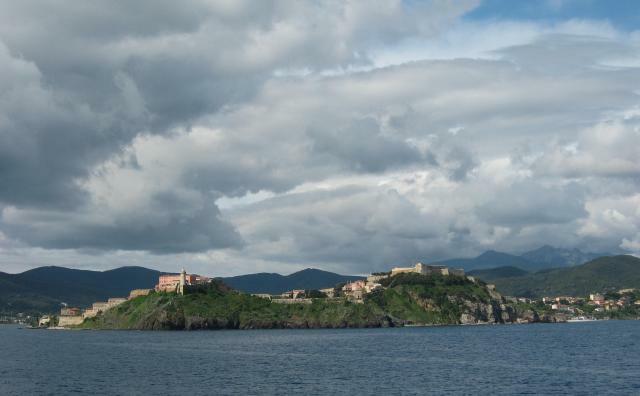 Elba is just off the coast of Italy, apparently too close to France since Napoleon made a comeback from there. We visited his confinement area, rather small and saw the same views he must have seen. 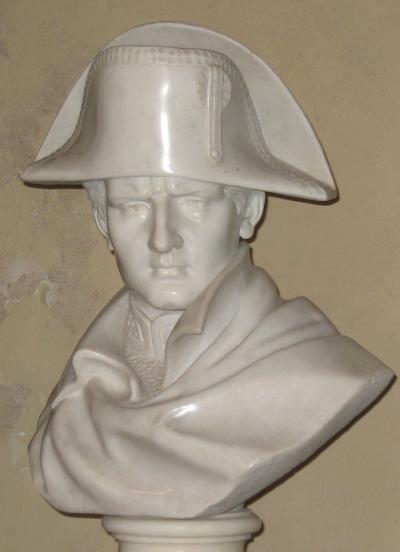 After his defeat at Waterloo he was sent to a small island in the south Atlantic, thousands of miles away from anywhere and never gained power again. Like all islands in the Mediterranean, it's mountainous and even the coastal town requires hiking up and down steep hills to see everything. 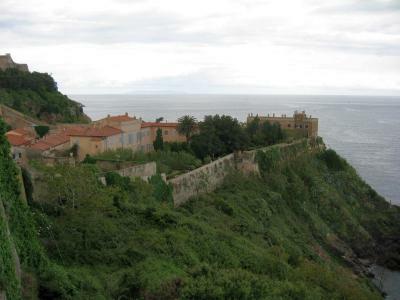 So hike we did to see Napoleon's house and the nearby fort with a commanding view of the harbor. On the way down we saw a boat coming into dock and was interested in seeing an example of docking aft to the concrete dock, Mediterranean style. I took a two minute video of the whole procedure. I had expected the boat to drop a bow anchor and back into the dock (at right angles to the dock, not along side like at PYC) but they had sent a dinghy in ahead of them which had picked up a line off the dock that led out to an mooring block already in place. He pulled up on the line attached to the dock and it led out into the harbor to the mooring block. As the boat neared the dock, he passed the line to a person on the boat who walked it forward tot he bow and started pulling on the line. Eventually, he pulled up a heavy line that was obviously attached to a substantial mooring anchor. He did this twice so he had two bow lines attached. He also had two other lines from the aft to the dock which held the boat taunt against the bow anchors. The boat was perfectly secure. It's a very efficient use of dock limited dock space but I wouldn't recommend it for anywhere with a current, tough backing a boat into a sideways current! If you want to see Mediterranean mooring in action, click on this video. The town itself was typically French with interesting shops and we spent some time just looking around, no bus tours today! Interesting clouds! 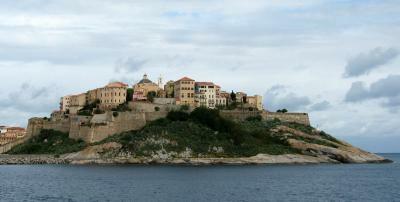 Corsica is on the way to Italy but it belongs to the French. It’s the birthplace of Columbus. 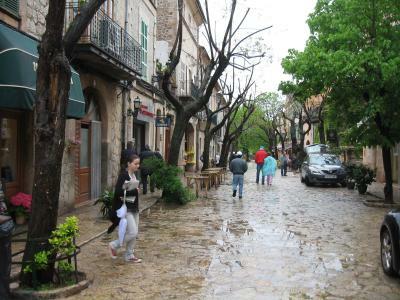 The place of his birth is located in the Citadel, the town pictured in the first photo. One wonders what the world would have been like if Columbus had not sailed west. 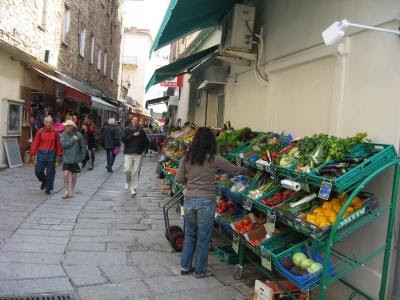 The town is typically French with the outdoor display of vegetables and narrow streets to negotiate. Nevertheless, we had full size buses for our tour through the mountains. 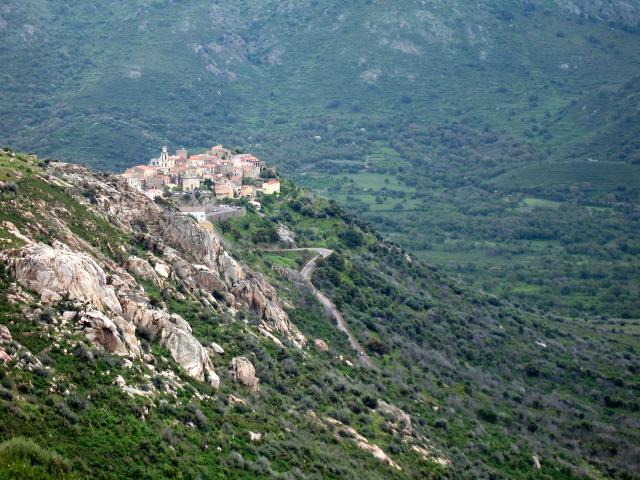 Even though Corsica is an island, they have 8000 ft mountains! With so many ups and downs, they place their villages on the sides or tops of cliffs, reserving the limited flat areas for crops. That makes for a very scenic ride and the roads are very narrow, especially when meeting another bus! I have a video of such an encounter and it seems like the sides of the two buses “melt” through each other. We just sat back and enjoyed the views, trying to ignore the impossible passages of other vehicles as well as the sheer drop-offs at the edges of the roads! Just look at this video to see what happends when two buses meet! The seas didn’t calm back to the previous levels until this morning. We met a couple that had been on the ship five times before and they said it had never been as rough as yesterday. The Royal Clipper crossed the Atlantic just before we boarded and several of the passengers we spoke to said the crossing was much better. They had wind and waves but the wind was not as great and the waves were long period rollers, not the shorter, steeper waves from several directions that were apparently reflecting off the nearby islands causing a confused sea. One person we met was from New York and he recalled one flight where they flew over Long Island Sound and the sun was low on the horizon and reflected off the water just right so he could see the waves. The wind was out of the north and he saw the waves marching south across the Sound as expected. What he didn’t expect was to see a second wave train going north that had been reflected off Northport! The two wave trains were interfering with each other as they crossed, going in opposite directions, in the middle of the Sound. I asked if he had a camera but he didn’t at the time. The lighting was most unusual to be able to see all that but I imagine something like that must happen in the Mediterranean too, especially with high winds and all the islands. The resulting boat motion is very uneven. 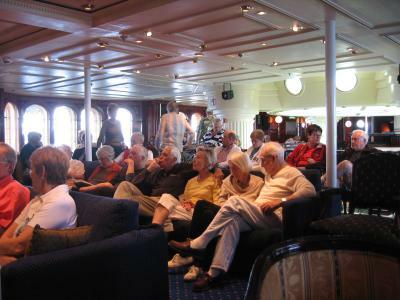 The captain gave a talk in the main lounge to a very interested group of passengers. He described the forecast he had received before the storm but he had nowhere to go. We were out in the middle of the Mediterranean without a nearby port suitable for the safety of the ship in 70 mph winds. Being at sea to “ride it out” was the safest choice, however unpopular with the passengers. During the Q&A he was asked what was the steepest roll the ship could take. He answered 77 degrees which would dip the yardarms into the water! I can only imagine what chaos that would cause inside the ship. There are no hand holds in the larger areas of the ship. What to do, stand on the windows? Despite what the brochure said, the ship does not have stabilizers. The captain said they were too noisy and didn’t work very well anyway. The company is building another, larger ship but it’s currently on hold due to the economy. Although the Royal Clipper is currently the largest ship in regular use, it will soon be only the third largest when two others are commissioned. The wind is still blowing pretty good with whitecaps aplenty but these are conditions the ship was built to handle with aplomb and although the ship is still rolling, it a much more controlled roll and easy to adjust to. Around 2:30 am we noticed that the motion of the boat was increasing and we were sliding all over the bed, hummm – what’s happening? We mostly ignored the pitching and rolling and as long as we kept our eyes closed and dozed, we were okay as far as seasickness was concerned. 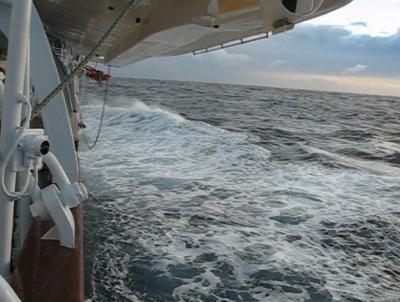 The motion gradually increased as it dawned and the challenge was to get out of bed and on deck successfully. The crew had placed seasick bags every few feet all over the boat but I made it okay to the open deck. The photos do not do justice to how rough the seas were! For a video of the seas, click here. Note that the 439 ft Royal Clipper is pitching pretty good. Looking out over the ocean, I saw why a 439 ft ship was pitching and rolling so much. The seas were huge, at least 25 ft waves. The peaks of the waves were level with the third deck. The next time we’re in port, I’ll try a measurement. In talking to one of the crew in the deckhouse, he said the winds peaked at 70 mph! We were out in winds only 5 mph short of hurricane force! We all camped out in the lounge near the middle of the boat for the least motion and managed to keep everything down. Movement in the boat was a stagger as the swells hit the boat broadside and rolled it from side to side. Chairs, tables, dishes periodically crashed adding to the general pandemonium. There were a lot of people looking not so good but I never actually saw anyone throw up although they might have done so in the privacy of their cabin. We took solace in the promise of a calm port on today’s agenda but then there was an audible groan when the steward announced that the port they were scheduled to enter was closed!! We guessed it was due to the weather (70 mph winds!) 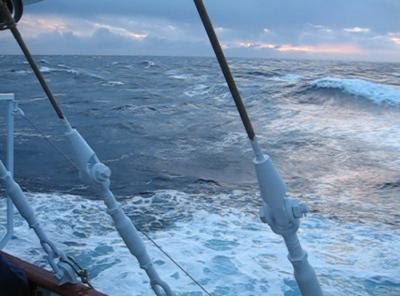 and now we were faced with two days at sea instead of just one – and in this weather! The passengers were not happy. For a second video of the seas, click here. We later learned that the ship rolled 8 degrees off vertical in the seas. Now that doesn't sound like much but consider that the ship is 54 ft wide and depending on the details of the roll, the up and down motion by the rails amounts to 10 to 15 ft! It's like being in an elevator for 24 hours with it going up and down 15 ft at a time. Worse, the cycles were not predictable. You would think, ah, the seas are calming and then, wham, another series of rolls and pitches! Breakfast was bread and water but not for everyone. The crew seemed entirely unaffected as were some of the passengers. I guess you can get used to anything. We started feeling better by lunch time and went down from the lounge for something to eat. All the ports in the dining room were shuttered, I guess as a safety feature in case the window was hit by a wave and broke? With that you couldn’t see out and had no horizon to use as a reference to counteract motion sickness. 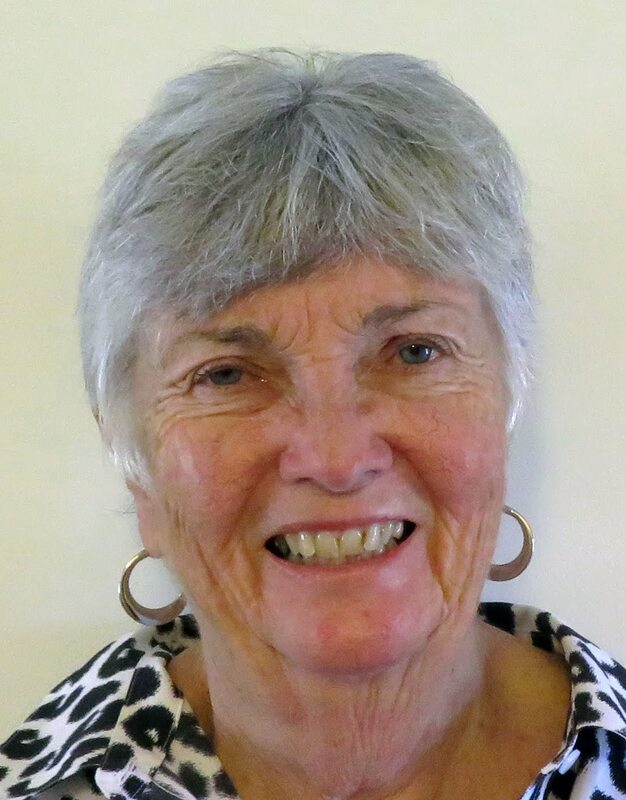 As Ann sat down at the table, the boat started a larger than usual roll and it pitched Ann out of her chair onto the floor and into a lady sitting at the next table. No harm was done but it gave you even more caution. There were people stumbling all over the place (but not the crew – they were steady). However, eventually even I got used to it. Ann was better than me and even returned to the room for our stack of crossword puzzles, I continued to occupy the upstairs lounge. A return to our enclosed room towards the front of the boat where the motion was greater was not in the cards for me although I was able to stomach a short return later in the day as we all grew more used to the motion. The rolling continued all through the day and night, side to side, fore and aft. Fortunately, we gradually grew used to it and we ate dinner at 8:00 but did not order wine this time. We discussed at great length why the captain didn’t alter course so the rollers didn’t hit the ship broadside which caused the severe roll. We sure had plenty of time, he was only doing 7 kts instead of the usual 12 kts in order to arrive at the next port on time and not early. On top of everything else, we were motoring with very few sails up, in fact we were a sailboat in name only. If we had any sails up at all, it was usually just the jibs and almost never the large, square sails. All this brings up the disadvantage of any type of ship that must sail to a schedule. They have to make ports at certain times. 70 mph winds, no problem – got to go! Needless to say, if it were on our boat we would have stayed in port. That’s the advantage of not sailing to a schedule, go when the weather’s good. It gives you pause about sailing in cruise ships in the future. Dinner that night was a full affair, no quarter was given to the rolling of the ship with the exception of using low glasses instead of the stem glasses usually on the table. The dinner servings had the usual flair with the courses decorated and displayed to the equal of any fine restaurant I’ve ever been in. Ann and I had roast duck, delicious, and dessert came surrounded by a small cage made of white and brown chocolate. How did they do that? Especially under the conditions that must have existed in the kitchen with the 25 foot seas! The day dawned overcast with a threat of rain as we came into Mallorca. We had given up any idea of a small, rural island like the ones we’re used to in the Caribbean. Well, Mallorca was thick with bumper to bumper traffic which we had ample time to experience in our bus tour into the mountains. The threat of rain materialized into reality with a vengeance. It poured! 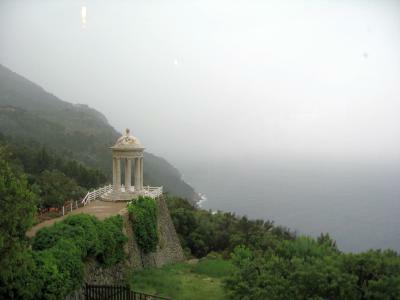 We toured gardens and a monastery in the soaking rain. All the islands we’ve been to have been mountainous and Mallorca was right there too. The scenery offered views of the mountains descending right to the ocean in steep cliffs. The Michelin guide gave the island two stars for views from the mountain road, a rare rating by Michelin. On the way back, the access road was flooded and we creeped along an interstate type road (on this small island!). On these cruises, the ship leaves on-time, regardless of whether everybody is aboard or not. They do make exceptions for excursions they schedule but not for anybody else just wandering around town. Another couple was on the way back to the boat and discovered that the road they had walked on the way out was now covered with three feet of water. It was now 5:30 which was all aboard time with the boat due to leave at 6:00! Having no other choice, they decided to wade through waist deep water in a dip in the road on the way to return to the boat. Otherwise, they would have to reach the next boat stop some other way to rejoin the cruise. We had a nice dinner, a bottle of wine and even went upstairs for a nightcap of another glass of wine. It was a quiet evening – or so we thought!! We continued making our way east towards Rome via the Spain coast. The unexpected feature of the coast is the presence of mountains right down to the sea. You can always see the mountains as we parallel the coast (and even snow on some of the taller peaks). Today we pulled into Cartagena, Spain. 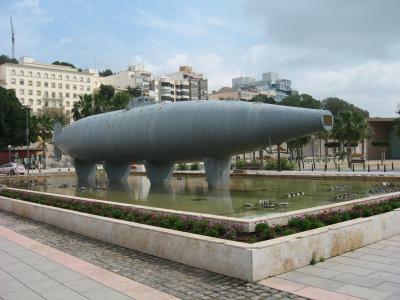 They are very proud of having (according to them) the first submarine in the world. However, the inventor who was a native of Cartagena was excommunicated from the church since God “didn’t mean for man to be under the water”. With that he went to Germany where they apparently didn’t have such compunctions. The city streets are all paved for walking with no cars allowed. It was a Sunday so there were parades and crowds all around. The street vendors were out in force selling flowers which made for a very colorful scene. With temperatures in the 70’s, it was very pleasant. It was interesting getting off the dock. We had a 15 kt wind blowing the 400 ft boat directly into the dock. Even with my boat, I’m not fond of that situation. He used the engine to warp off the dock, pushing the aft out into the harbor and backing out. It was tight since he had to keep the bow off the dock as he backed. He was helped by having bow thrusters but even then it was not easy with all the windage he had to contend with. The scuttlebutt is that if the captain puts a mark on the boat, he’s fired! The captain was personally operating all the controls during the maneuver and we made it off without incident. Leathem and Ann went on one of the tours but we stayed on the boat and took a walk to the beach. 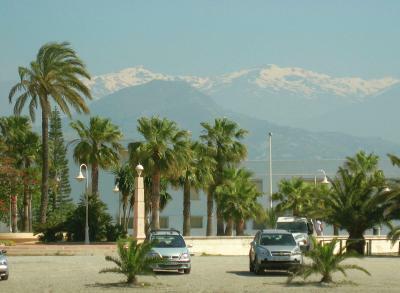 This area of Spain is quite mountainous and we could even see snow covered peaks in the distance! One of the things that Ann has always said is how unrealistic some of the painting exercises are on TV when one painter in particular always mixes palm trees with snow covered mountains in the same painting! Ann now has to reevaluate her judgment of that particular painter since we now have hard evidence of palm trees and snow covered mountains existing in the same scene. May 1st is Labor Day in Europe so everything is closed. It’s still cool but there are a few people at the beach. It’s now a fine sand but rather coarse and the water temperature is around 60F, it hasn’t warmed up yet. The crew of the ship is constantly busy. 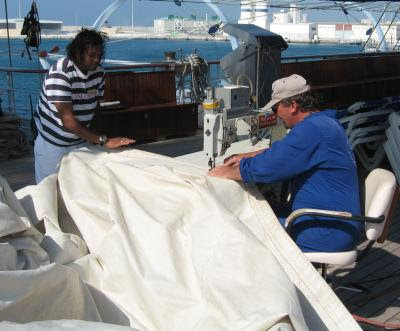 On the top deck they were repairing a sail that was blown out during the crossing of the Atlantic before we boarded. They had large waves and a following sea, reaching 16 kts in boat speed at times! When we walk the top deck in the morning, we’ll invariably see some section of the boat being varnished or painted. One constant of a sailboat is that there is always something that needs attention! They don’t varnish the teak deck itself, they have some solution they apply resulting in a natural gray color. I asked about the brand but the sailor didn’t know. All the other teak is kept in tip top varnished condition. When I left the ship for a stroll in the afternoon, the crew had two buckets of paint, one white and one blue. They were looking for any spots that needed a touch up and had small rollers to apply dabs of paint. No marks were allowed to remain. Even the bottom of the launches were a spotless white. I guess when you have over a hundred crew on board, they find ways to keep them busy.